The kids love these! I think they’re great packed in a lunchbox, the kids agree. Tastey jelly with chunks of apple, what’s not to like. We do love little jelly cups for a quick sweet snack and for dessert. A yummy jelly served with or without a little scoop of ice cream or some jelly. My Kids loved this product and I think it is an excellent snack. It’s healthy but also like a treat for them and fits in their lunchboxes. Good value for money. Never lasts long in my house great size for lunch boxes to. Also handy they come with little plastic spoons not a worry when they don’t come home. I always have these in the fridge for a quick and easy snack for the kids (and for me). I love this particular flavour combination. This is a lovely treat which I sometimes buy to take on day trips. Everyone in my family likes it and the flavour is delicious. I would certainly keep buying this product and would recommend it to other Moms to try. Convenient & gets him eating! My sensory seeking texture hating 8 year old loves these! Certainly not the most healthy product, but he is eating! That’s important to me! My 4 year old loves these! He has these as a treat. Quite often you will find myself sneaking one into my lunch box for work. Great as a treat for kids although I don’t give this to them regularly due to the sugar content and jelly mixed with fruit equals double sugar. We always ensure that these are in the fridge. My son loves them as a snack or as dessert after he has eaten all his dinner. Perfect serving size and a great sweet treat. These chilled are so refreshing on a hot day, however they are a little on the sweet side. 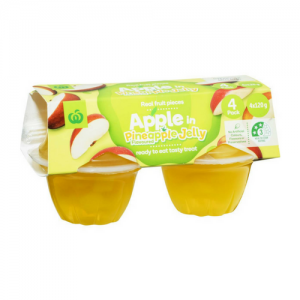 How would you rate Woolworths Apple In Pineapple Jelly 4pk 480g?